The Skinny: The American version of the Golden Harvest-produced bio Bruce Lee: The Legend is a decent, occasionally daring biography of the man nicknamed "Little Dragon." Review by Calvin McMillin: Since Bruce Lee: The Legend is included as the bonus fifth disc in 20th Century Fox's "Master Collection" boxset, the film must be worth at least a look. 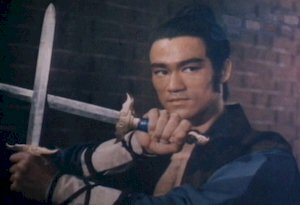 Generally speaking, the movie does a good job of tracing Bruce Lee's life, mainly in the form of career highlights that showcase his early stints on American television shows (in "The Green Hornet" and "Longstreet") on up to his eventual ascension to cross-cultural superstardom through his Hong Kong movies. Though there are some references to Jeet Kune Do and Bruce's personal philosophy and family life, this documentary is a bit lacking in intimacy when compared with the much more polished John Little bio, Bruce Lee: A Warrior's Journey. However, there are several points of interest within the film. For one, there is rare archival footage of Lee back when he was a child actor in Hong Kong movies. The sight of such a young boy already possessing some of the trademark Bruce Lee mannerisms is quite a sight. There's even some footage of Bruce Lee's that is both intriguing and repellent: his funerals in Hong Kong and the United States. Notable mourners include James Coburn, Steve McQueen, Nora Miao, George Lazenby, Shieh Kien and Robert Clouse. Notes: 	Includes footage from Warriors Two, Zu: Warriors from Magic Mountain, Winners and Sinners, Zatoichi, and Duel to the Death.  Sammo Hung cameos when writer Russel Cawthorne and Raymond Chow walk through an HK film set.